Amazing as Jocelyn’s brownies are, I’m always on the look out for different recipes; there’s a little part of me that thinks that elusive best ever brownie could be waiting to be found in that next batch I bake. In the last couple of months I’ve posted recipes for Chocolate & Dulce de Leche and Easy Chocolate Brownies, so this week I decided to try something a little bit different. Cue a recipe from my current favourite cookbook, River Cottage Every Day. I’ve blogged a couple of Hugh’s recipes already – a sinfully rich little black dress chocolate cake and a moist, syrupy carrot cake. This recipe lies somewhere between the two. 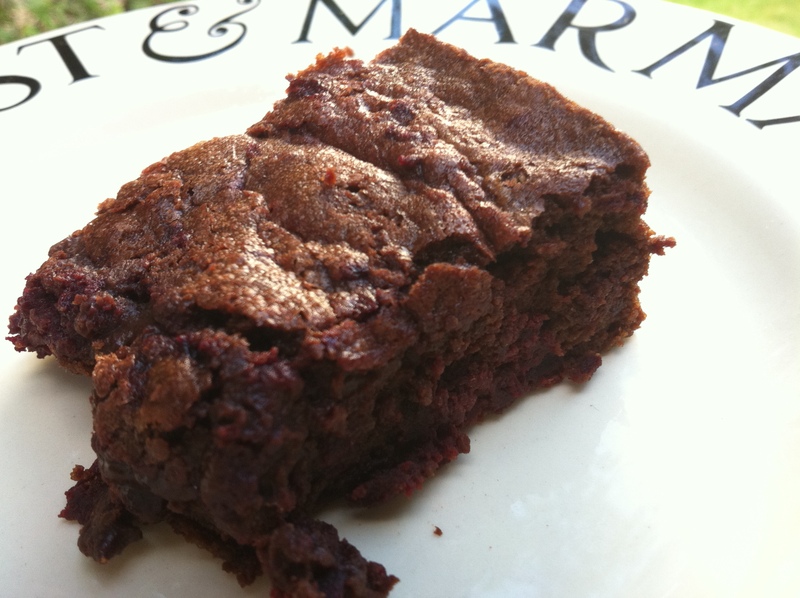 Here Hugh provides his brownie take on a carrot cake by using grated beetroot in the batter. It sounds a bit bonkers, and does taste a little different from your classic brownie, but the result is totally delicious. The beetroot adds colour and texture without imparting any strange vegetable flavour (I’m not normally a fan) and the pink veins running through the brownie are very pretty. Harry Eastwood of Cook Yourself Thin fame has carved a niche for healthier versions of classic treats, most famously substituting cooked vegetables such as courgette, pumpkin and carrot for more calorific butter and flour. Cook Yourself Thin this is not – these brownies still contain enough butter, chocolate and sugar to sink a small battleship – but you can feel smug in the knowledge that you’re getting a small amount of your five-a-day embedded in this chocolaty goodness, as well as the benefits of unrefined flour and sugar. 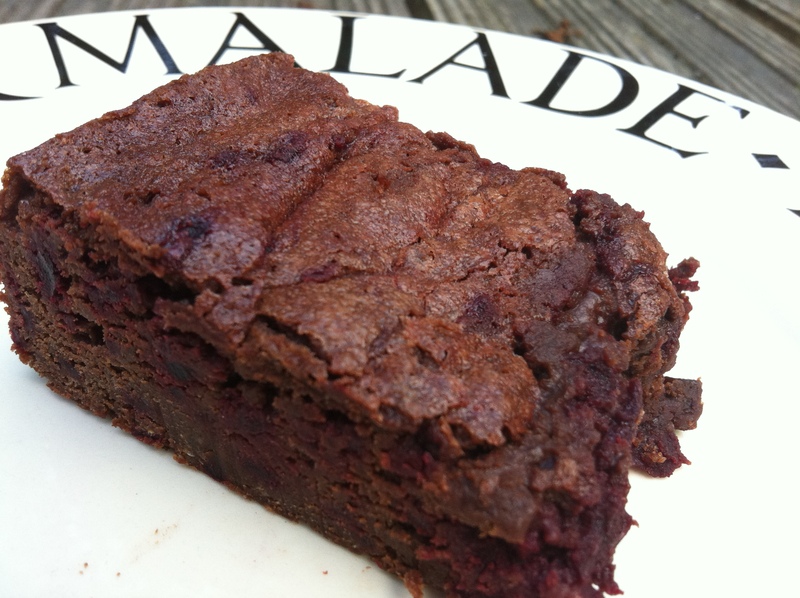 These brownies are rich and velvety, but slightly lighter than a traditional brownie. If you wanted them a little fudgier I’d suggest substituting some or all the flour with ground almonds. And while the grated beetroot adds an interesting texture, I think next time I’d grate it a little finer, or even puree, for a smoother, rounder finish. The recipe below makes about 16 large or 20 regular brownies. Grease and line a baking tin – I used a 22 inch square. Preheat the oven to 180 degrees C. Melt the chocolate and butter in a bain marie then remove from the heat and leave to cool completely. Whisk the eggs and sugar until well combined. Beat in the cool chocolate and butter mixture until completely incorporated. Sift in the salt and flour then fold in gently with a large metal spoon. 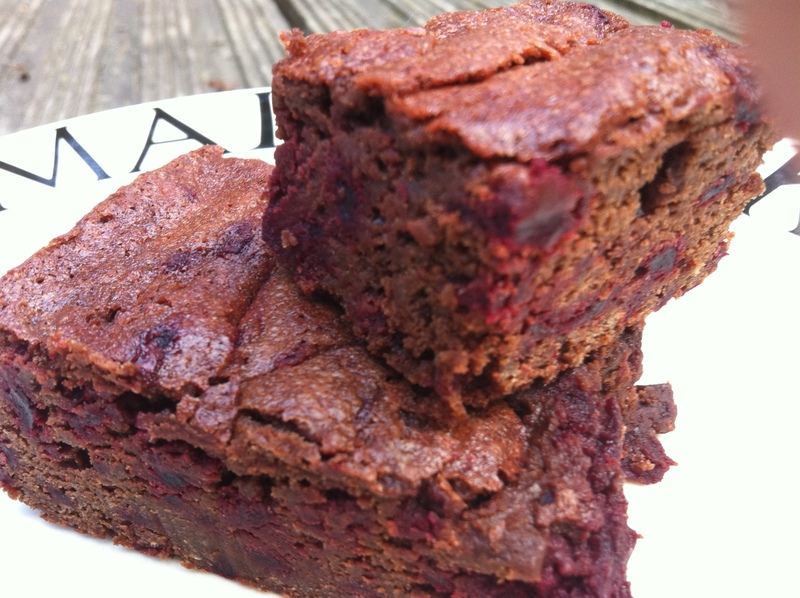 Finally add the beetroot and stir to incorporate – be careful not to over mix as this could make the brownies tough. Pour the mixture into the prepared tin, tap against the work surface to level and pop in the oven for about 20 minutes. If it doubt, take the brownies out early – you can always set an undercooked brownie in the fridge, but if you overcook them there’s no going back! Leave to cool completely for perfectly formed brownies, or cut into more ragged warm squares and serve with dollop of ice cream for the ultimate indulgence. Hey there, just discovered your blog, what a find. Yummy looking brownies and stuffed quid. Bring on the summer. Thanks 🙂 Summer is finally here – bringing out the BBQ this weekend and can’t wait! What a lovely idea. I tihnk Beetroot must be great in these . Will give a go! Ohh these sound delicious. I was looking for something to make with the beetroot I just picked from my garden. I think the combination of beetroot and chocolate sounds intriguing. I am looking forward to giving it a go.